Though a little black dress is almost always appropriate, I couldn't think of a better place to debut this Byron Lars Beauty Mark treasure than a December evening at the ballet enjoying The Nutcracker. At first glance, the subtle, tonal print looks like a houndstooth design, albeit in a more feminine, sheer fabric. 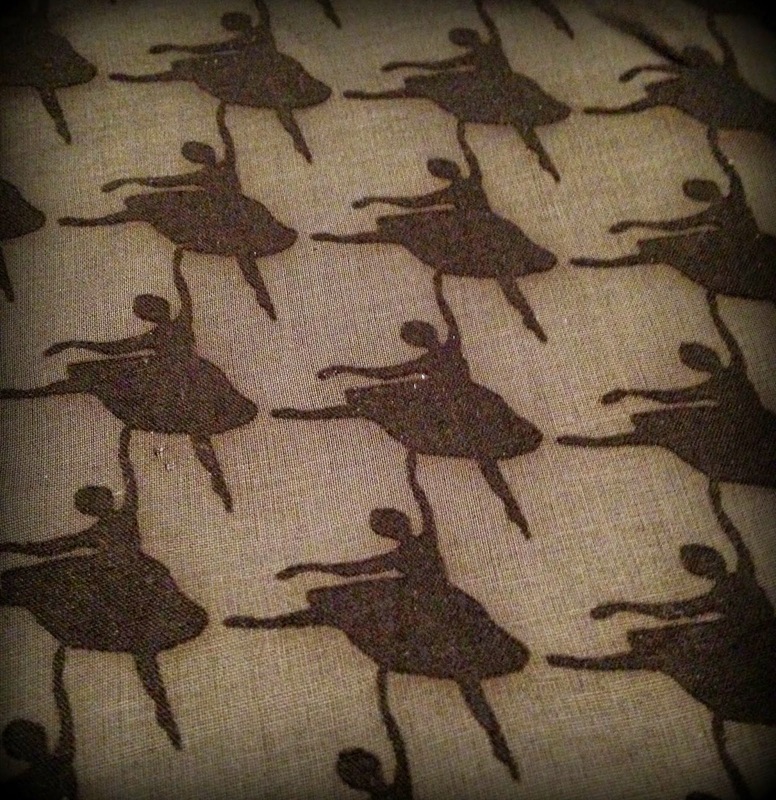 On closer inspection, however, you'll see that the traditional menswear pattern is actually made up of hundreds of tiny ballerinas dancing their way across the frock in a graceful arabesque! This dress is all about the unique, sheer fabric. If you follow Red's Shoe Diaries, you probably already know that Byron Lars is one of my favorite contemporary designers. His dresses are completely unique yet timeless, and their construction and quality is impeccable. This LBD was no exception. I fell in love with it the first time I saw it. Apparently everyone else did, too, because it quickly sold out on Modcloth.com, and couldn't be found anywhere else. After a few months of periodically googling it, I finally found a single dress, new with tags, listed on eBay. Despite the fact that it was two sizes larger than I normally wear in Byron Lars, I had to have it. As expected, it was too big. A "go to" wide black belt took care of the loose waistline, but did nothing to address the pleated and draped bodice that bunched and gaped in an unflattering way. I should have taken it straight away to a tailor, but the vision in my head of what the dress could be got ahead of my sewing skills and for a brief, shining moment I was overcome by the bright idea that I could take care of it myself.... At this point I should probably mention that my prowess with needle and thread is limited to repairing loose buttons. Yet, there I sat on the floor of my closet, scissors in hand, carefully separating the tiny dancers on the bodice from the cotton underlay beneath. Of course, a few minutes later as I held up the two pieces of sheer fabric that had once formed the front and back of the dress's elegantly pleated and draped top, I realized I had made a colossal mistake. managed to salvage the mess I made. I was too embarrassed to take my "handiwork" to my favorite local seamstress, who shares my love for Byron Lars' designs and will no doubt be appalled when she reads my online confession. But then I met Spencer Sholty, a promising young fashion design student from the Art Institute of Indianapolis who was willing to take on the challenge of re-engineering the top of the dress with two scraps of fabric and no pattern. 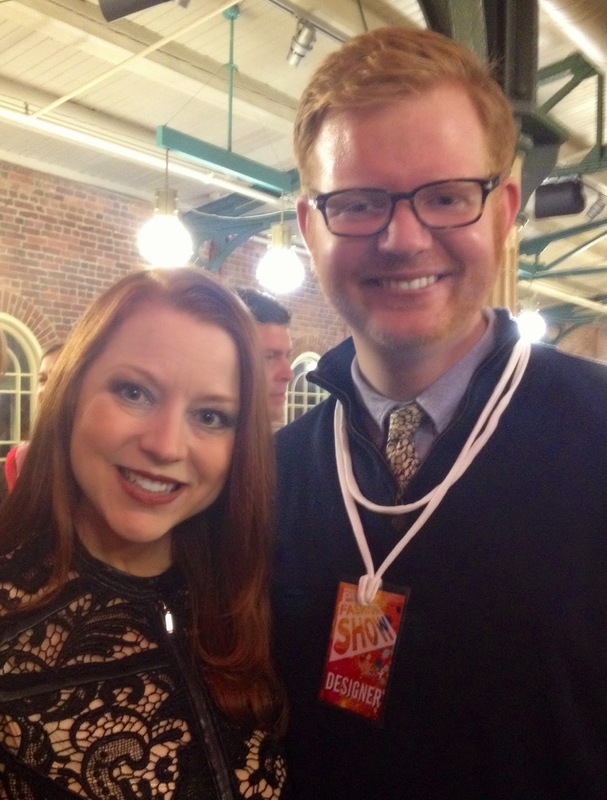 Spencer and I bonded instantly over our ginger locks, a shared love of Dr. Who, and an affinity for 1950s era clothing. It has been fun to watch his growth as a designer, not to mention fortuitous, since he rescued my dress and all.... That said, I have learned my lesson - I will NOT be cutting up any more dresses, and the next time I collaborate with Spencer, I hope it will be over an original design! I love that the Butler Ballet includes local dance students in the annual production. Watching 9 year old Gracie beaming from the stage as she performed with the university students made this my favorite performance of The Nutcracker ever! 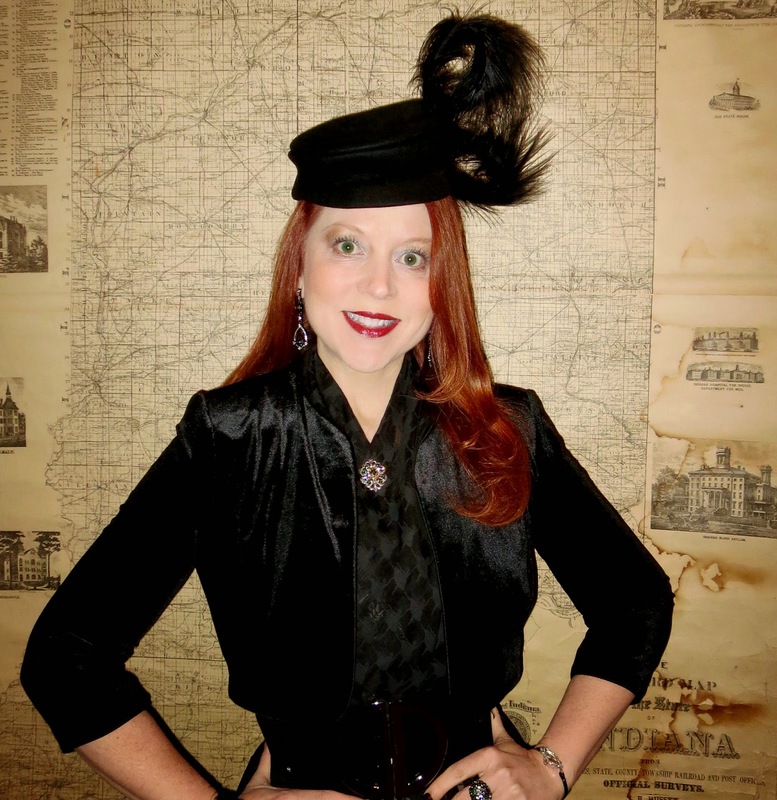 As it turned out, the vintage 1940s tilt hat I paired with my Spencer Sholty-salvaged dress was unintentionally reminiscent of those donned by the Mother Ginger Dancers, which I only realized as I was putting this post together. This is the second year in a row that I've attended Butler University's performance of the ballet. 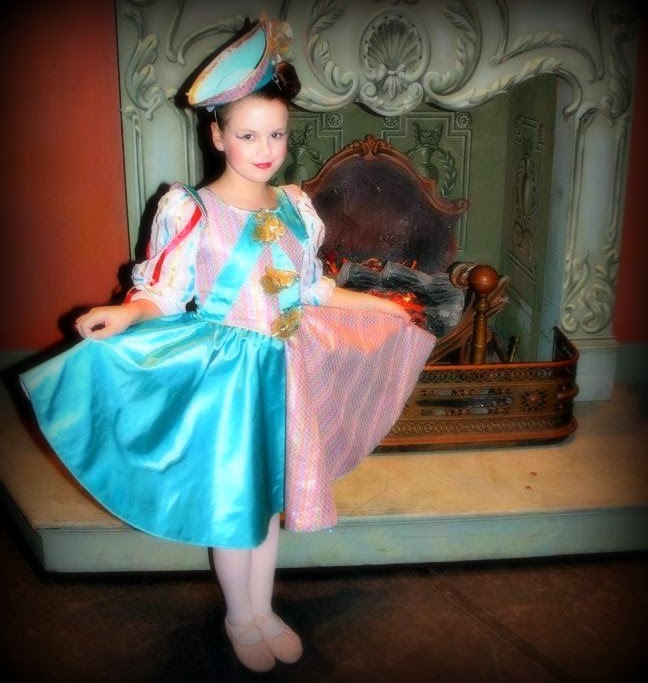 Last year, I went in search of inspiration for the Nutcracker-themed birthday party I helped plan and orchestrate for the 9 year old daughter of some dear friends (party-planning is my not so secret passion, you know). This year, I went to cheer on that same darling little girl as one of only a handful of young ballet students selected for a role in the university's annual production - a singular goal she's worked toward since her first exposure to the ballet at age 6. I nearly cried when she danced out from under Mother Ginger's skirt in the Second Act. I don't think I could have been prouder if she was my own daughter! Oh, Jody, if only you knew how many mishaps I've had with my above-average appraisal of what I could accomplish with a snip here or there. I love this dress AND your online confession! Thanks, Crystal! At least it wasn't a one of a kind vintage find, and it all worked out in the end! Look at that map. I love it! Great meeting you today. Thanks, Emma! I'm so glad we got to chat this morning, and I look forward to seeing your board come to life.